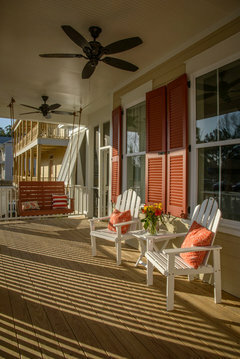 What color to paint exterior shutters? And door? 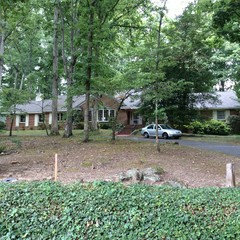 We bought a wonderful 1950's house but the exterior paint is peeling and MUST be repainted soon. The wood trim is a beige tan (similar to Behr Riviera Beach) and since part of the house has siding that is permanently that color, so we are going with that. But what about the door and shutters? Right now they are the same beige tan. Help! Hi jenharn, nice house! I might pick one of the darkest tones from the brick for the shutters and door. Sometimes black or charcoal can look good with brick. 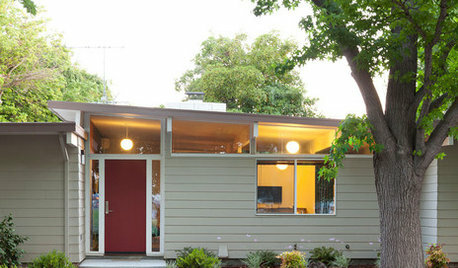 It's a little hard to tell in the photos...is your roof more gray or brown? Whatever color you choose for the shutters and door, I'd leave the inside trim on the windows a soft white. The height of your shutters is throwing me off a bit. They should match the height of the windows, so you might think about changing that. Also, regarding your last photo...shutters should be sized in proportion to the window. If they were to actually close, they would cover the entire window. One more thing...I usually like a soft white or cream with brick. I think your current shutter color would look better if the shutters were more in proportion to your window size. Thank you Chloe! The roof is brown. And I will ask about getting the shutters cut down to the height of the windows. 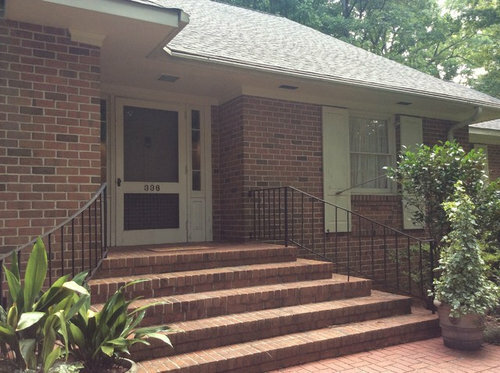 What color doors & bench for a white exterior with black shutters? What I did was to take the predominating color from the flowers around my house and paint my front door and bench. In my case, purple (think Columbine, not eggplant); it draws the flowers and house together making for a cohesive picture. I can't tell what color your flower baskets are from your picture, but I do see some yellow flowers in your yard. You might try picking up the yellow from your flowers in a deeper tone like Carolyn suggested or possibly your flower basket color; assuming you tend to buy the same color baskets each year. Since you have 2 doors, I'd highlight the door you wish people to use by painting it your 1st color choice and use a deeper hue 2 chips down on the paint strip as the color choice for your secondary door and bench. 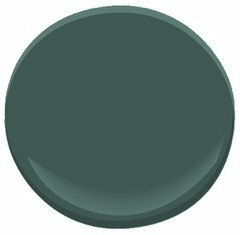 I also like Carolyn's suggestion of green on the shutters; I'd go with a very DARK green. BTW, I suggest a darker shade for your secondary door and bench for a reason. My mother-in-law had a similar set-up and for some reason people never knew which door to use. 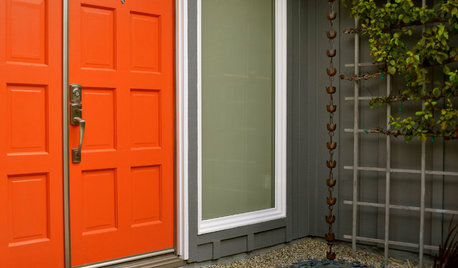 By choosing the lighter color on your main door, your subconsciously directing people to your door of choice. Taupe sounds nice for the front door -- also, consider removing the shutters and just framing the door in a nice, substantial trim, painted black......replace the light fixtures with big, black iron lanterns, and put large black iron house numbers on one side of the door, along with a chunky black mailbox, simple and traditional....paint the rest of the shutters, and the panels beneath the windows, black.....maybe the raised molding on the panels could be painted to match the front door, and consider hanging either a large black iron trellis, or some other iron feature (such as a sunburst) on the chimney to highlight it, maybe even with a small spotlight on it for evenings. 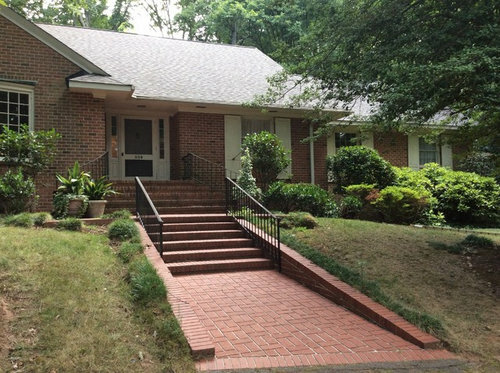 Oh, and paint the railings black.....a couple of pots of flowers on either side of the door and a bit of shrubbery to soften the brick might help.....remove or trim the shrubs blocking the windows......also maybe a doorknocker, if you decide to remove the storm door. An extended porch would be wonderful but pricey, a good project for when you can afford it, but for now my suggestions would probably not break the bank. It's a nice house, good luck! Hi Kelly! We love Hudson Bay. I went and got the sample from the paint store. My husband is too conservative for the red color for the door. 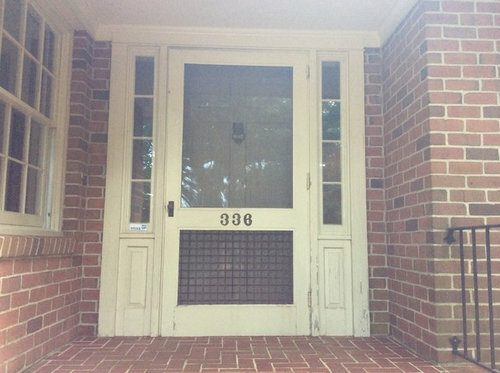 Do you recommend we paint the door the same color as the shutters or do we do keep it a different color like a cream? What do you think? I would paint shutters and door olive green. I also would remove shutters from the run of 3 windows. 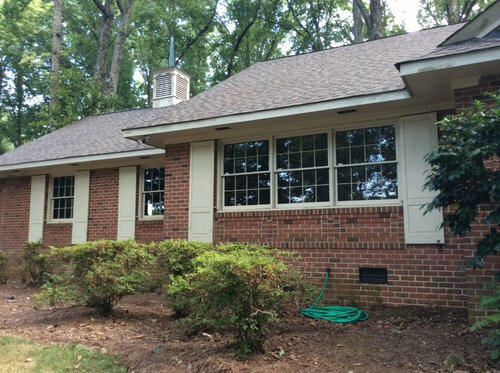 Can you reattach, after resizing, the shutters on the smaller windows so that they are operable? Is there a large bay window? How about painting the trim on that olive green also, leaving other trim of the rest of the windows the beige. If the roof is brown you could go with the darkest tone in the brick. 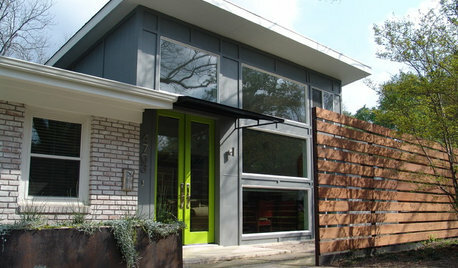 Another color that might work with your brick and roof is Ben Moore's Tarrytown Green. I would leave the inside window trim white, as well as the trim along the roof and eaves. 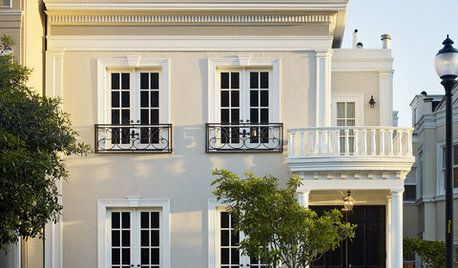 Your shutters and front door could be the Tarrytown and maybe keep the sidelights white. A couple urns out at the end on each side of your brick walkway. Personally, I'd remove the screen door, and put your house numbers to the right of the door on the brick facing the street. Thanks joy! Here's a picture showing the bay window. Thanks Chloe! I do like that tarrytown color. Your photo showing the bay window makes me think the Tarrytown Green would work nicely. I would probably keep the trim around your bay window white, but a close-up of it would help more. 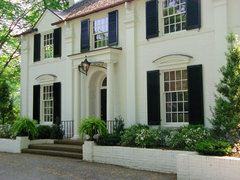 I have family members who used the Tarrytown on their brick colonial home's shutters and front door. Sorry...I don't have permission right now to post a photo, but it's a lovely home. The inside trim on all the windows is white, along with the portico. The screened-in porch trim on one side of the house is all white. The combination of the brick, Tarrytown and white paint work beautifully. They were even contacted by HGTV magazine to feature their home in an article regarding curb appeal. The homeowners declined but it was a nice compliment....and well-deserved! I think Tarrytown Green or yhe other suggestion would look great with the tan. I would not do white at all with your house. It is quite a beautiful home & lot! What a great house. 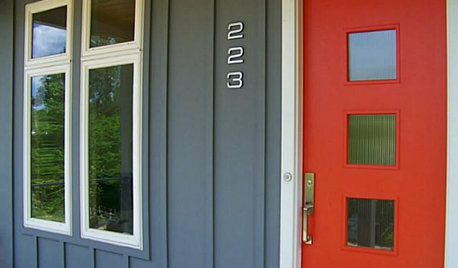 We used SW Ravishing Coral on the door of a brick house we painted white (SW White Duck). It turned out awesome! We were really picky about the shade of coral and this was a great choice. Beautiful home. 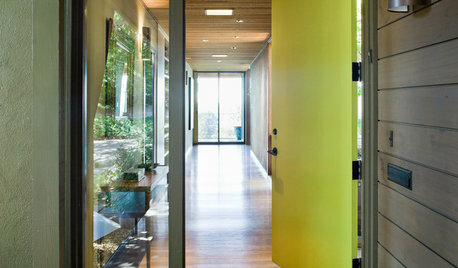 To bring it into this century, ditch the shutters completely & paint the entire door (sidelights included) lime green. 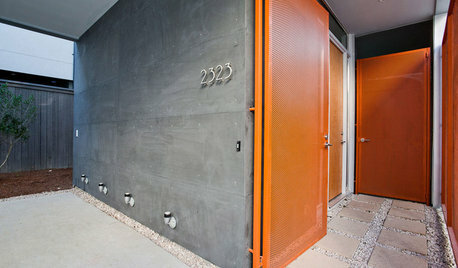 (It's just a door & paint which you can easily change in 5 yrs or so when trends change). 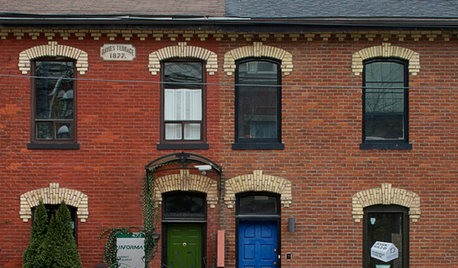 Lime will look great w/your existing red brick & cream trim. You will have the most beautiful & interesting home in the neighborhood. Be brave, go bold! 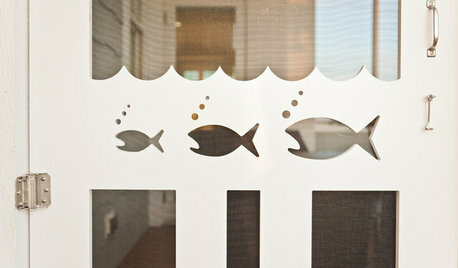 TRADITIONAL STYLEShutter Cutouts: A Window to One's Soul?